The boot camp is over. 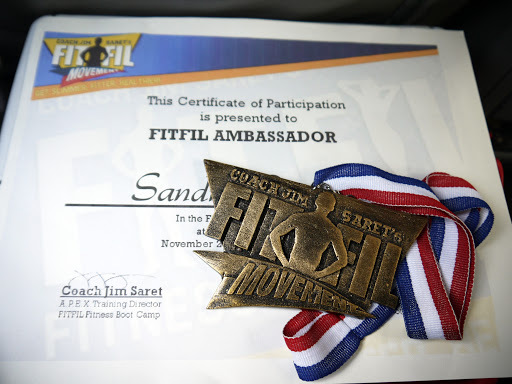 Last Saturday, December 15, 2012 was the graduation of the 3rd batch of the FitFil Movement. It was held in the Music Hall of the Mall of Asia. Everyone was in high spirits and the atmosphere was very positive. The coaches encouraged each participant to continue the healthy lifestyle that Fitfil jumpstarted. They were very inspiring and were all passionate in helping and motivating us. Thank you all! Before they gave us our medals and certificates, they required us to do the 500 workout. I was under the weather that morning so I asked my coach if I could be excused. Haha- No, I wasn’t being lazy. I did finish 80 crunches and 40 staggered push-ups. Then I felt dizzy so Coach Air told me to rest. I promised him that I’ll do the workout this week. 125 crunches/ reach for the sky for a total of 500. Tuesday, December 18, three days after the FitFil graduation I finally fulfilled all the requirements. I graduated, albeit on remedial. 🙂 I am A FitFil Ambassador! Woohoo! Now that the boot camp is over, I’ll continue to do the workouts we learned. My favorite is the Tabata workout. I’m challenging myself to do a four-minute Tabata workout everyday for 30 days. Go, go, go!